Around 70.8 million smart meters were installed in the U.S. by the end of 2016. The same year, global electric vehicle (EV) stock surpassed 2 million. Data from this growing collection of smart meters and EVs can provide valuable information to optimize grid and transportation assets towards minimizing operational costs and maximizing overall social welfare (even jointly between these two infrastructure systems). It can also be used to plan installation of new assets over time. However, access to that data can reveal personal information about individual users (their usage patterns and preferences). Thus, unsolicited targeted advertising and/or people with criminal intent could gain unprecedented access to personal data. We must develop ways to optimize relevant assets without directly revealing individual usage patterns. 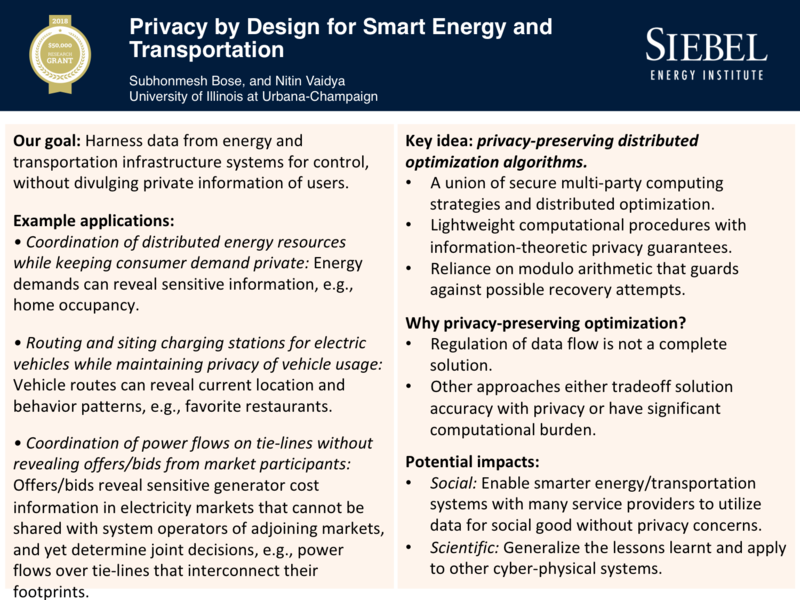 This project aims to provide such a framework for privacy-preserving optimization for energy and transportation systems. We will also apply similar techniques to preserve privacy in energy/transportation markets where scheduling decisions are determined through a centralized or peer-to-peer market system. There, the goal is to reach the optimal decision without revealing market offers and bids from the market participants. Subhonmesh Bose is an Assistant Professor in the Dept. of Electrical and Computer Engineering, University of Illinois at Urbana-Champaign where his current research interests lie in understanding the operation and economics of modern power systems, leveraging tools from convex optimization, control theory, microeconomics, and game theory. He received his Master’s and Ph.D. degrees in Electrical Engineering from the California Institute of Technology in 2012 and 2014, respectively. Prior to joining Illinois, he was an Atkinson Center Postdoctoral Fellow in Sustainability in the School of Electrical and Computer Engineering at Cornell University. He received his Bachelor’s degree from the Indian Institute of Technology Kanpur, India in 2009. He was a co-recipient of the Best Paper award in System Operations and Market Economics at the IEEE Power and Energy Society General Meeting 2013. Blockchain technology has opened new frontiers for creating trust in decentralized cyber-networks. Bringing that kind of trust to the physical world can be very useful. However, interesting possibilities for attacking as well as securing CPS systems arise when the cyber-world interacts with the physical world. This project focuses on two such possibilities. 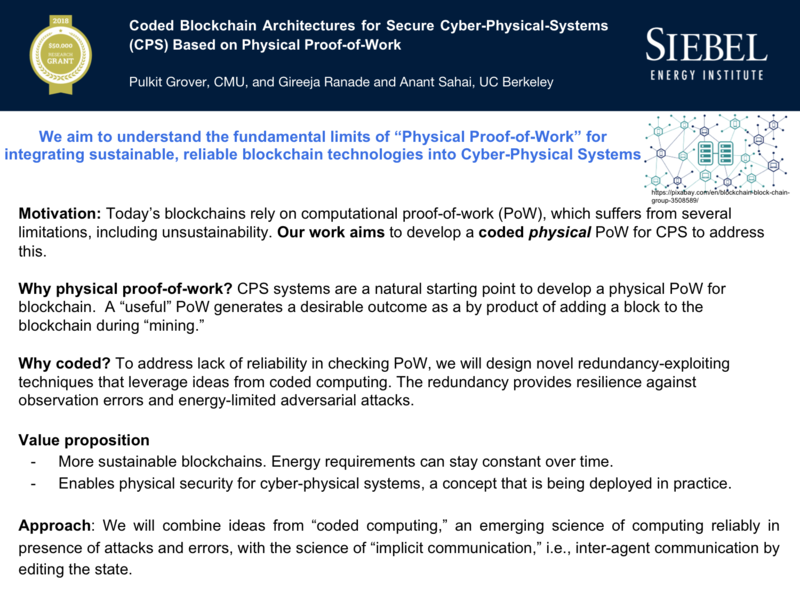 First, the physical world operates in real time, and many CPS applications operate under delay-constrained scenarios where trust is needed immediately and not just eventually, limiting the ability to perform computationally intensive operations that are typically used to establish Proof-of-Work (PoW) in cyber-only blockchains. We observe that this problem can be addressed by another aspect of CPS: the agents’ ability to affect the state of the system, and can thus provide the possibility of a physically useful PoW. Second, the sensors and actuators and communications of compromised agents can be attacked, creating false consensus. To address this, we propose to exploit the opportunity for “redundancy-coding” provided by the inherent low-dimensionality of the physical world, what we describe as cyber-dynamics augmentation. 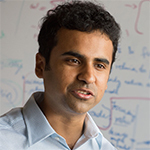 Pulkit Grover (Ph.D. UC Berkeley) is an Assistant Professor at Carnegie Mellon University (2013-present). His main contributions to science are towards developing and experimentally validating a new theory of information (fundamental limits, practical designs) for efficient communication, computing, and control (e.g., by incorporating novel circuit-energy models). To apply these ideas to a variety of problems, including novel biomedical systems, his lab works extensively with system and device engineers, neuroscientists, and doctors. 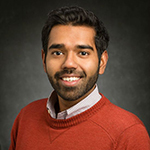 Pulkit received the 2010 best student paper award at IEEE CDC; the 2011 Eli Jury Dissertation Award from UC Berkeley; the 2012 Leonard G. Abraham best journal paper award from the IEEE ComSoc; a 2014 NSF CAREER award; a 2015 Google Research Award; and a 2018 inaugural award from the Chuck Noll Foundation for Brain Injury Research. He presented an ISIT’17 tutorial on “coded computing,” an emerging science of computing in presence of faults, delays, errors. The modern power grid has become much more reliable and efficient, owing mostly to the integration of IoT technologies enabling a data-driven operation. For example, the cyber-infrastructure that is now overlaying the power grid enables the collection and analysis of data from millions of distributed end-points such as smart meters, phasor measurement units, and circuit breakers. One of the biggest challenges is to develop cloud-based approaches for advanced data-analytics that would transform the unprecedented influx of sensing data into efficient and reliable operational decisions. On the other hand, the integration and dependency upon the cyber-infrastructure and cloud-based systems leads to the possibility of cyber attacks or leaks that might potentially reveal sensitive user data, violating the privacy of the individuals. 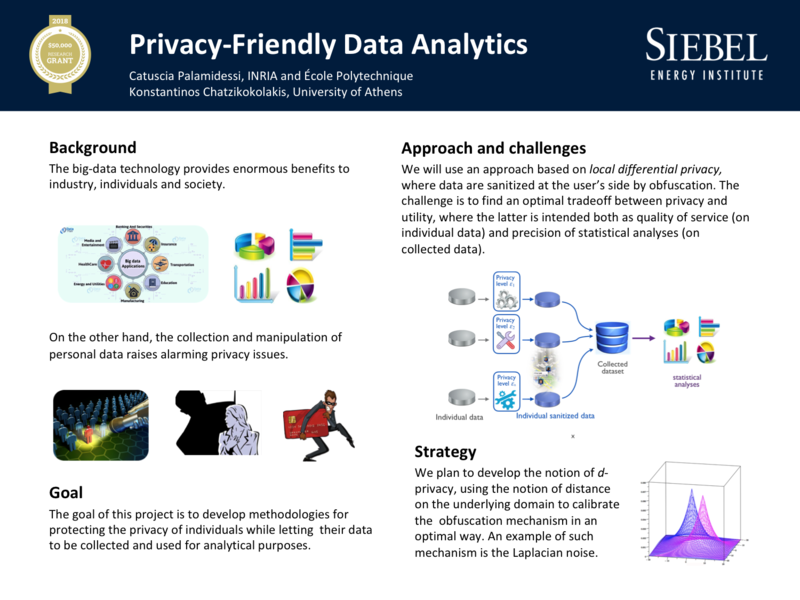 In this project, we will use tools from dynamic learning theory and multi-arm bandits to develop methods and algorithms that allow obtaining information necessary for operational decisions (e.g., demand prediction, detection of demand-supply mismatch, statistics of power usage) from an influx of privacy-protected data. Gauri Joshi is an Assistant Professor in the Department of Electrical and Computer Engineering at Carnegie Mellon University since Fall 2017. Prior to that, she worked as a Research Staff Member at IBM T. J. Watson Research Center. Gauri received a Ph.D. from MIT EECS in June 2016 and B.Tech and M. Tech in Electrical Engineering from the Indian Institute of Technology (IIT) Bombay in 2010. 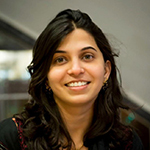 Her awards and honors include the Best Thesis Prize in Computer Science at MIT (2012), Institute Gold Medal of IIT Bombay (2010), Claude Shannon Research Assistantship (2015-16), the Schlumberger Faculty for the Future fellowship (2011-2015) and the IBM Faculty Research Award (2018). 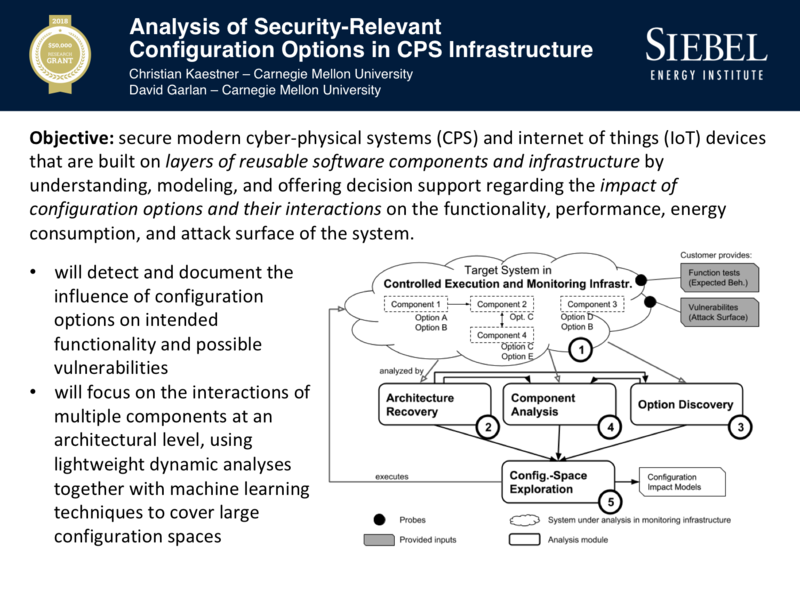 This project aims to secure modern cyber-physical systems (CPS) and internet of things (IoT) devices that are built on layers of reusable software components and infrastructure by understanding, modeling, and offering decision support regarding the impact of configuration options and their interactions on the functionality, performance, energy consumption, and attack surface of the system. This will lead developers to make more informed decisions and to build more secure and more performant and energy-efficient systems with lower development and testing cost. 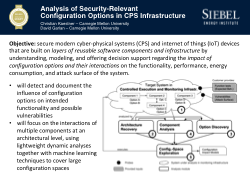 The research will detect and document the influence of configuration options on intended functionality and possible vulnerabilities of a service or device, narrowing down the configuration space to configurations that enable successful functioning of the service or device and document which configuration decisions affect the attack surface. To achieve this, the research will focus on the interactions of multiple components at an architectural level and will use a combination of lightweight dynamic analyses together with machine learning techniques to cover large configuration spaces, repeatedly running the system and its components in a controlled setting to observe behavior and characterize its attack surface under different configurations in a form of sensitivity analysis. 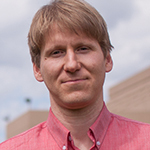 Christian Kaestner is an Assistant Professor of Computer Science in the School of Computer Science at Carnegie Mellon University. He received his PhD from the University of Magdeburg in 2010. For his dissertation, he received the prestigious GI Dissertation Award for the best computer science dissertation in 2010. He is a member of the IFIP group 2.11 on Program Generation. His research interests lie in reducing variability-induced complexity in software systems. He has developed the TypeChef project that can soundly parse, type check, and statically analyze C code over large configuration spaces without preprocessing at the scale of the Linux kernel with 14,000 configuration options. He combines programming-language research and software-engineering research in the areas of software product lines, feature-oriented programming, modularity, metaprogramming, software analysis, program comprehension, and program transformations. 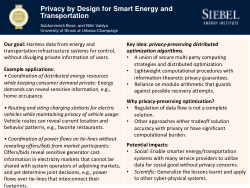 As the smart grid concept revolutionizes the modern electric grid, the computing requirements of power system operations become more challenging and complicated. In particular, the big data analytics in power systems relies heavily on high-performance computing technologies. 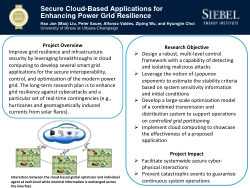 Cloud computing is opening an unprecedented opportunity in power system applications for the secure interoperability, control, and optimization of the modern power grid, thus enhancing grid resiliency. In that context, the goal of the project is threefold. First, we propose a secure multi-level control framework consisting of local area controllers interacting with the cloud. 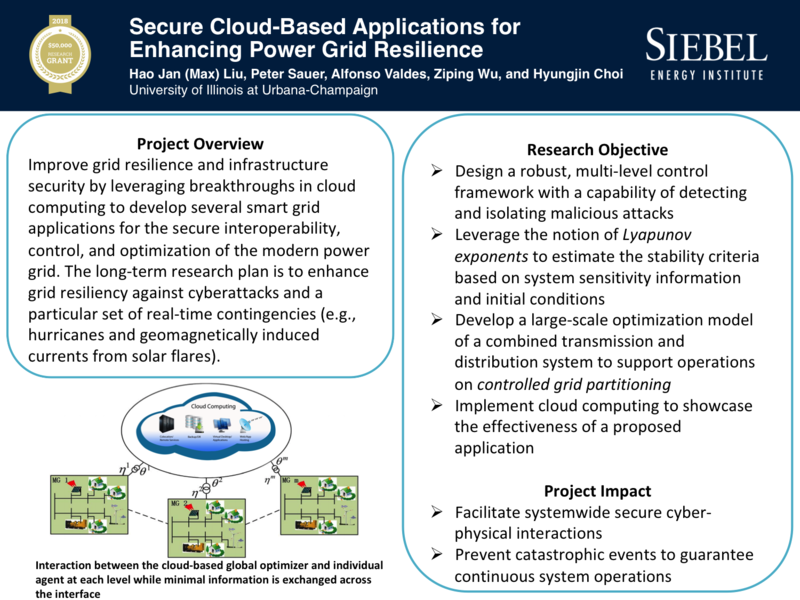 This design will be capable of enhancing power system stability and resilience while offering mitigation strategies against malicious cyberattacks on the hardware and software elements, utilizing cyber-physical knowledge of a power system. Second, by adopting the local/cloud-based control model, we will leverage the computational power of the cloud to perform look-ahead simulation in faster-than-real time under some critical power system emergency states and apply machine learning to classify system stability from precursor states under potential attack scenarios. Finally, to mitigate the effects of catastrophic events such as natural disasters, we will explore analytics to enable grid islanding by design in order to alleviate system stresses while protecting equipment, thereby ensuring continuity of electricity supply and facilitating fast restoration. Our cloud-based applications will unify attractive features of autonomy and security while promoting a resilient, efficient, and sustainable smart grid. Hao Jan (Max) Liu is a Siebel Scholar in Energy Science. He received his B.S. degree with highest honors from the Missouri University of Science and Technology in 2011 and earn his M.S. and Ph.D. degrees from the University of Illinois at Urbana-Champaign in 2013 and 2017, respectively; all in Electrical and Computer Engineering. 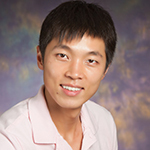 Dr. Liu is currently a Research Scientist in UIUC’s Information Trust Institute. His expertise lies at the intersection of power systems, control, optimization, and machine learning. Recently, his research interests have been in the investigation and development of secure control applications for cyber-physical power systems. Dr. Liu received a National Science Foundation East Asia and Pacific Summer Institutes Fellowship in 2015 (PI), the 2nd Best Paper Award at the 2016 North American Power Symposium (NAPS), and a Siebel Scholar in Energy Science Award in 2017. The importance of joint dynamics of physical processes and cyber elements in power grids has increased dramatically in recent years. 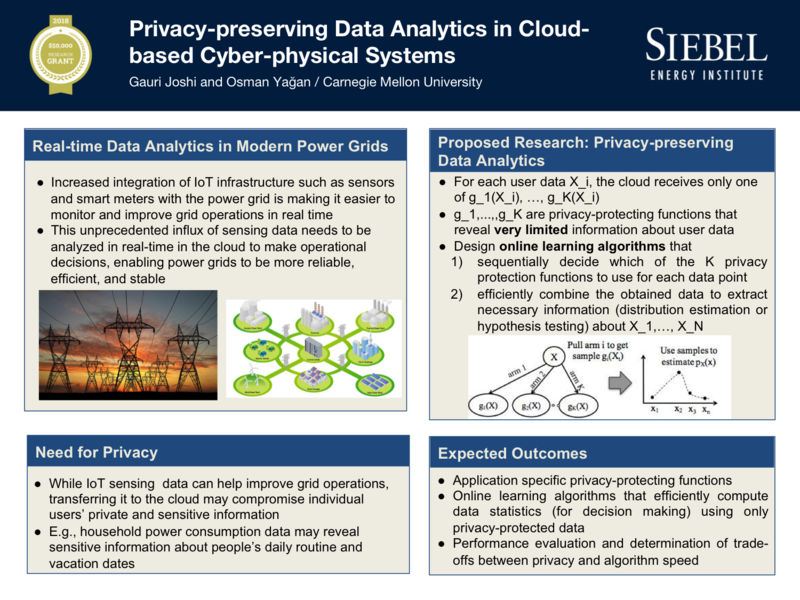 Such joint property can be captured by modeling power grids using hybrid systems—a formal model for combining both discrete behavior of the cyber part and continuous behavior of the physical part. 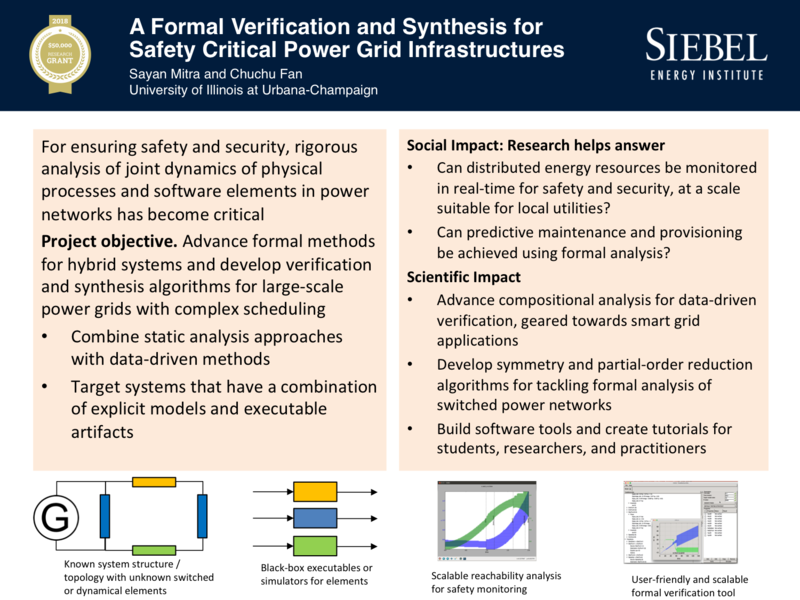 The objective of this project is to advance several formal methods on hybrid systems and use them to develop a verification and synthesis tool for large-scale power grids. Existing formal verification tools do not scale to large-dimensional hybrid systems due to high computational complexity. 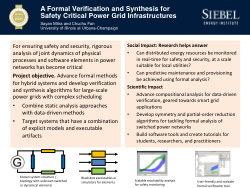 In this research, we will tackle the difficulties of verifying and designing controllers for smart power grids by combining several efficient technologies that drastically lower the complexity but provide formal guarantees of safety and security. 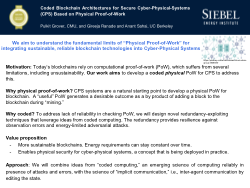 We aim to bridge the formal proofs of these techniques and the analysis and design of power grids by implementing a formal verification and synthesis tool for such systems. 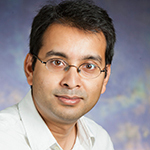 Sayan Mitra is a Professor of Electrical and Computer Engineering at the University of Illinois at Urbana-Champaign and an affiliate Professor of Computer Science. His research interests are in formal verification, control theory, security and privacy in controlled networks, and safe autonomy. His work has led to the development of several award-winning tools for verification and synthesis of nonlinear models of cyber-physical systems. He holds a PhD from MIT, an MSc from the Indian Institute of Science, Bangalore, and an undergraduate degree in EE from Jadavpur University, Kolkata. He was a postdoctoral fellow at the Center for Mathematics of Information of CalTech, and held visiting faculty positions at Oxford University, TU Vienna, and the Air Force Research Laboratory at Kirtland. His research has been recognized by National Science Foundation’s CAREER Award, AFOSR Young Investigator Research Program Award, Dean’s Award For Excellence in Research from UIUC, a RiSE Fellowship from TU Vienna, and several best paper awards. Improving power grid’s security against cyber-physical attacks has been a major challenge for power grid operators since the cyber attack on the Ukrainian grid in December 2016. 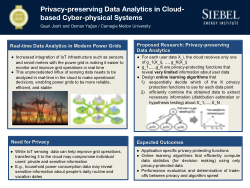 In this project, we will focus on cyber-physical attacks on the power grid that cause equipment failures in grid’s physical infrastructure and simultaneously manipulate the measurements in order to hide the physical failures from the grid operator. 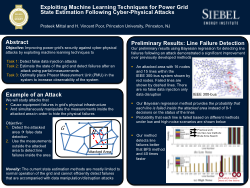 Our objective is to employ state-of-the-art machine learning techniques to detect false data in the measurements, estimate the state of the grid, and detect failures after such attacks. Our recent results using machine learning tools (e.g., Bayesian regression) have demonstrated that our methods outperform previously developed methods in efficiency and accuracy. 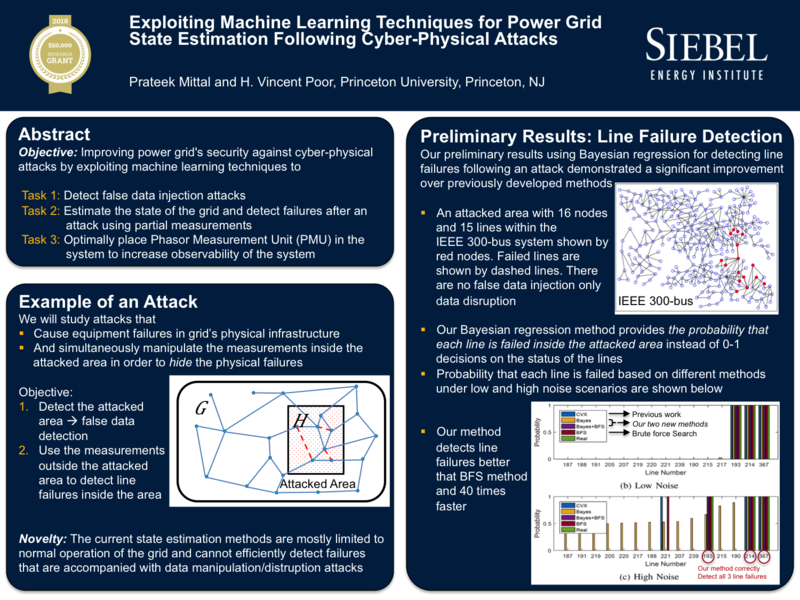 In this project, we plan to deepen our analysis and systematically investigate the application of machine learning tools in power grid security. 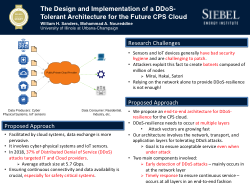 Our project consists of three tasks: (1) devising efficient machine learning-based methods to detect false data injection attacks, (2) developing methods to accurately estimate the state of the grid and detect failures after cyber-physical attacks, and (3) designing methods for optimal Phasor Measurement Unit (PMU) placement in the system to increase observability of the system after a potential attack. Our project will significantly enhance the power grid’s security by providing efficient tools to detect suspicious activities and to reduce their consequences in the event of grid control system compromise. The developed tools will have applications beyond cyber-physical attack scenarios and can further be used for reliable power grid state estimation at other critical scenarios, such as at the time of natural disasters. Prateek Mittal is an Assistant Professor at Princeton University. 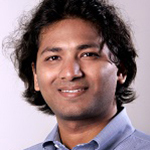 His research aims to design and develop secure and privacy-preserving systems. A unifying theme in his work is to manipulate and exploit structural properties of networked systems to solve security and privacy challenges facing our society. His research has applied this distinct approach to widely-used operational systems, and has used the resulting insights to influence system design and operation (including that of the Tor network and the Let’s Encrypt certificate authority). He is the recipient of faculty research awards from IBM, Intel, Google, Cisco, the NSF CAREER award, the ONR YIP award, the ARO YIP award, and Princeton University’s E. Lawrence Keyes, Jr. award for outstanding research and teaching. With the ever-increasing use of Internet-connected devices, such as computers, smart grids, IoT appliances, and GPS-enabled equipment, personal data are collected in larger and larger amounts, and then stored and manipulated for the most diverse purposes. Undeniably, the big-data technology provides enormous benefits to industry, individuals, and society, ranging from improving business strategies and boosting quality of service to enhancing scientific progress. On the other hand, the collection and manipulation of personal data raises alarming privacy issues. 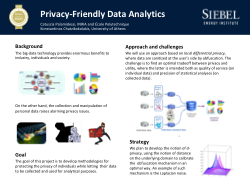 The objective of this project is to develop methodologies for protecting the privacy of individuals while letting their data be collected and used for analytical purposes. We aim in particular to develop methods and tools that: (1) are robust with respect to inference attacks (i.e., the combination of information from different sources), (2) are controllable by and transparent to the user, (3) are multi-layer and flexibl , so to adapt to the privacy goals and the use of the data, (4) defy security breaches, and (5) provide an optimal tradeoff between privacy and utility. Catuscia Palamidessi is Director of Research at INRIA, where she leads the team COMETE in the CS lab of the École Polytechnique. She got her PhD from the University of Pisa in 1988. She held full professor positions at the University of Genova (1994-1997) and at the Pennsylvania State University (1998-2002). Her research interests include privacy, secure information flow, and concurrency theory. She had a leadership role in many national and international projects, including: coordinator of the ANR projects REPAS and PANDA, coordinator of the French sites for the Marie Curie IRSES project MEALS, and coordinator for the IAT projects PRINCESS and PRINTEMPS. She has h-index 41 according to Google Scholar. She has been PC chair of 12 conferences and PC member of almost 100 conferences. 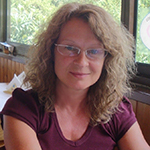 She is on the editorial boards of MSCS (Cambridge University Press) and Acta Informatica. Ensuring continuous data and communication availability is at the heart of maintaining near real time data analysis and operational control of the modern interconnected infrastructure, especially with the widespread adoption and deployment of Cyber Physical Systems (CPS) and the Internet of Things (IoT). 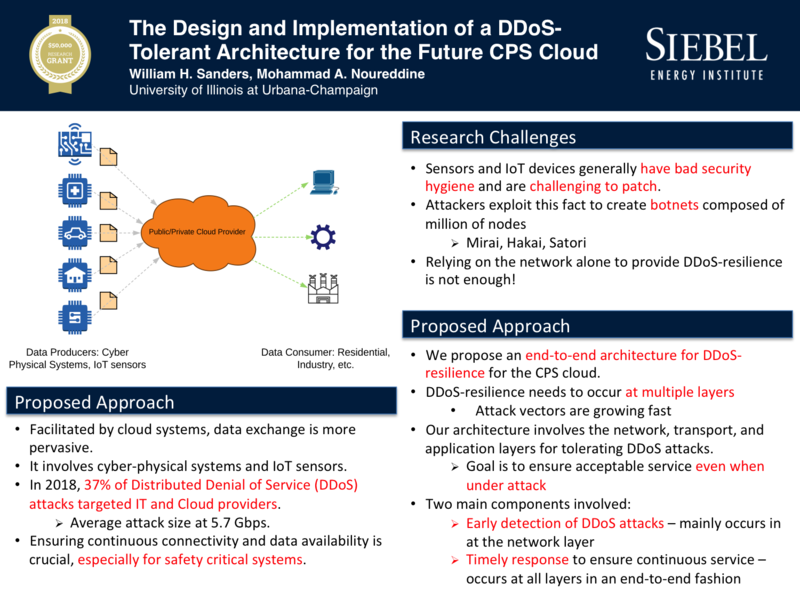 The pervasiveness and low cost access barrier to Distributed Denial of Service (DDoS) attacks threaten the availability and timely delivery of data and operational controls. Successful attacks can have drastic financial as well as societal consequences, especially in the energy transmission and delivery sector. In this project, we plan to leverage the available data analytics methods to devise mechanisms for the early detection of such DDoS attacks. Furthermore, with the integration of cloud services in the CPS and IoT sectors, we aim to leverage the elasticity and flexibility of the cloud infrastructure to provide timely response to detected flooding attacks. Our goal is to design a resilient networking infrastructure that withstands DDoS attacks and provides continuous service throughout. William H. Sanders is the interim director of the Discovery Partners Institute and a Donald Biggar Willett Professor of Engineering at the University of Illinois at Urbana-Champaign. He is a Fellow of the IEEE, the ACM and the AAAS, a past Chair of the IEEE Technical Committee on Fault-Tolerant Computing, and past Vice-Chair of the IFIP Working Group 10.4 on Dependable Computing. 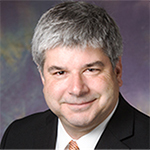 At UIUC, he was formerly the head of the Department of Electrical and Computer Engineering (serving 2014-2018), the founding Director of the Information Trust Institute (2004-2011), Director of the Coordinated Science Laboratory (2010-2014), and Director and PI of the DOE/DHS Trustworthy Cyber Infrastructure for the Power Grid (TCIPG) Center, which was at the forefront of national efforts to make the U.S. power grid smart and resilient. His research interests include secure and dependable computing and security and dependability metrics and evaluation, with a focus on critical infrastructures. He has published more than 270 technical papers in those areas. Continuous operation and maintenance of the water grid is an important driver for ensuring adequate health and wellness of the population. Improper treatment or distribution of water can lead to increased levels of (i) toxins (such as lead or other heavy metals) that cause problems with adult health and childhood-development, and (ii) biological pathogens that cause water-borne diseases. With increasing aging of water infrastructure in the developed world, as well as increasing urbanization and population growth in the developing world, new solutions are needed to ensure the proper functioning of the water grid in the presence of malicious actors seeking to causes disruptions. Distributed storage and sensing technologies for water are gaining in deployment in both the developed and developing world, but there has been little research to date on the creation of attack detection and mitigation strategies that use such data to secure the water grid with distributed resources. 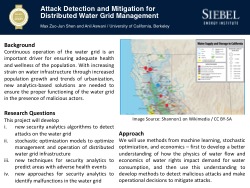 This research activity will study three related problems: First, how to use distributed water grid sensing to detect malicious attacks on the operation of the water grid. Second, how to use distributed water sensing data to identify malfunctioning infrastructure in the water grid. 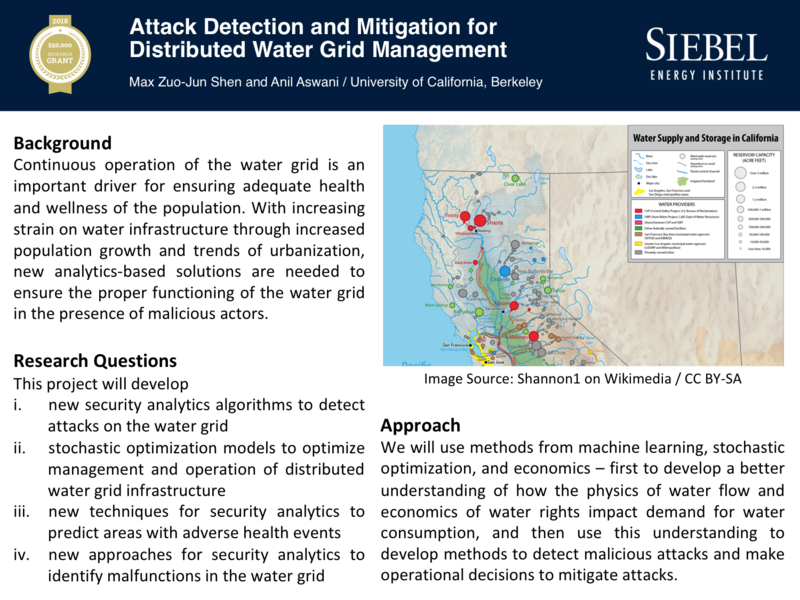 Third, how to manage distributed water storage resources to mitigate detected attacks against the water grid infrastructure. Zuo-Jun (Max) Shen is a Professor in the Department of Industrial Engineering and Operations Research and the Department of Civil and Environmental Engineering at University of California, Berkeley. He is also a Center Director at the Tsinghua-Berkeley Institute at Shenzhen. Shen received his Ph.D. from Northwestern University. He has been active in the following research areas: integrated supply chain design and management, design and analysis of optimization algorithms, energy systems, and transportation system planning and optimization. He is currently on the editorial/advisory board for several leading journals. 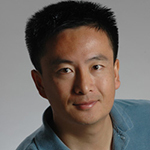 Dr. Shen is a Fellow of INFORMS and a recipient of the CAREER award from the National Science Foundation. Electric power grids are complex, large-scale systems with tens of thousands of components that operate via a hierarchy of optimization and control algorithms to serve millions of consumers. Power system operators have traditionally resorted to heuristic and approximation techniques to keep the decision-making process manageable. However, recent studies by the U.S. Federal Energy Regulatory Commission (FERC) show that these conservative techniques suffer from major shortcomings, which lead to wasting a significant amount of energy and incur costs exceeding $1Billion annually in the U.S. 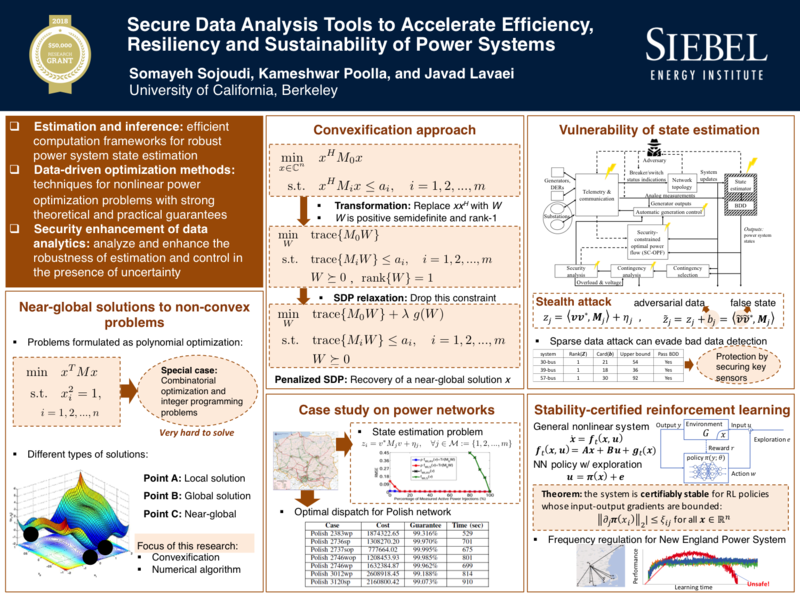 The lack of secure data-driven, learning-based, and adaptive algorithms is a major impediment to the operation of efficient, resilient, and sustainable electrical power systems, since compared to traditional grids they are prone to significantly more uncertainty, have a higher modeling error, include a considerably larger number of controllable nodes, and require a much faster decision-making process. 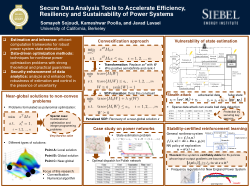 This project aims to leverage the availability of spatial and temporal sensory data to develop secure analysis and decision-making tools that are essential for the operation of future power systems. The objectives are: (1) the design of provably accurate learning techniques to extract reliable information from raw data for a sophisticated nonlinear system; (2) the design of efficient optimization techniques to solve complex, data-driven operational problems; (3) the robustification of learning and optimization methods to cyberattacks and malicious activities; and (4) the quantification of the benefits of the developed methods on different real-world systems. The interdisciplinary research project draws from recent advances in optimization theory, machine learning, data analytics, and control theory to address the above objectives and leverages the highly nonlinear relationships induced by the underlying physics of power systems to detect abnormalities and possible compromises in sensory data. Somayeh Sojoudi is on the faculty of the Departments of Electrical Engineering & Computer Sciences and Mechanical Engineering at the University of California, Berkeley. She is an Associate Editor of the journals of IEEE Transactions on Smart Grid, IEEE Access, and Systems & Control Letters. She is a member of the conference editorial board of the IEEE Control Systems Society. She received the 2015 INFORMS Optimization Society Prize for Young Researchers and the 2016 INFORMS ENRE Energy Best Publication Award. 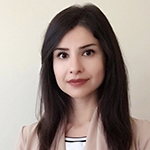 She was a finalist (as advisor) for the Best Student Paper Award at the 2018 American Control Conference and a finalist (as co-author) for the Best Student Paper Award at the 53rd IEEE Conference on Decision and Control 2014.